Let's face it: spam is just not a pleasant subject to deal with or talk about. But the fact is, we all deal with it every day in each of our online accounts, and spammers make a living off of constantly devising new tactics to get their insidious messages before our eyes. Since so much of our fight against spam goes on behind the scenes, we wanted to describe some of the ways we've been helping you combat comment spam in TypePad as well as tell you how we're improving our fight in the future. Years ago, as spammers began to identify blogs as a target for their attacks, our staff would manually craft rules to catch the spam. Over time, spammers grew in number and sophistication and these rules became more complex and unwieldy, requiring manual intervention to deal with each new type. It soon became critical to ramp up our spam fighting efforts. At the beginning of last year, we created a team within Six Apart whose exclusive focus is fighting spam. They set out to build a learning system that automatically adapts to new types of spam attacks, with the purpose of reducing the amount of spam that lands on your blog in the first place. Hopefully those of you who have been with TypePad for a few years have seen a noticeable reduction in the amount of spam that gets through to you. This learning system is also trained to let the good comments through, thereby minimizing the time you spend thinking about spam. Some TypePad bloggers deal with spam by moderating their comments and just deleting any spam that gets through. This is a great way to prevent spam from getting published on your blog, but there is a better way to deal with spam. By taking a few seconds to report the spam, you're feeding vital information to our learning system, helping to make it even better. Your spam report helps prevent that strain of spam from going out to other blogs (or coming back to you again). As you can see from the above example, the learning system keeps getting better as bloggers feed it information. These spam improvements have been running behind the scenes on your TypePad blog for over a year. For those of you who added captchas to your blog comments to help fight spam, you might want to disable the comment captchas to see if it makes for a better commenting experience for your readers. TypePad's spam blocking service is a free service for TypePad members, and it's constantly updated with improvements and information from the built-in learning system. The entire blogosphere benefits when we combat spam. Blogging is just better without it. In order to feed more information into our spam filter's learning system, and to fight spam around the blogosphere, we are in the process of launching a beta version of TypePad's spam fighting service for free to additional bloggers. We're calling it TypePad AntiSpam and it can be used with supported plugins that work with Movable Type, WordPress.org, and any other platform which supports spam plugins. This will expand the information coming in to our spam filter's learning system, and will make TypePad AntiSpam smarter for everyone who uses it. The TechCrunch blogs have been using TypePad AntiSpam and you can see for yourself Michael Arrington's thoughts on the service. We're offering TypePad AntiSpam as a free, open source service to additional bloggers for several reasons. The learning system gets better as more information comes in, and that learning is passed on to benefit all bloggers using the service. Less spam makes blogging better, and frankly we don't want to profit off of spammers' success. As a TypePad blogger, you've already been using our AntiSpam service and do not need to take any action to continue receiving the spam-fighting benefits. It's not likely we'll see an end to spam any time soon, but together we can make it even more difficult for spammers to get through to us and to the people who read our blogs. If you'd like to try out TypePad AntiSpam on one of your other blogs, or recommend the service to your friends, please read more details on the TypePad AntiSpam page. A huge thanks to everyone who has sent in their feedback and questions about the recent upgrade to the Compose screen! We wanted to take a moment and address a few of the most common concerns we've heard from the community. Is this a beta release of the Compose upgrade? No. Though not every TypePad member is seeing the new Compose screen yet, every member will eventually be upgraded to it over the next few weeks. The Compose screen is no longer in beta -- as we mentioned in our previous post, it is being rolled out in phases to all members. Is my browser affecting my experience with the new Compose? For the best experience with the new Compose, you should use one of our supported browsers. If you need a free upgrade for the browser you're using, our list of supported browsers includes handy links for you. I already like the font I selected in my design - do I have to select this font again when I use the new Compose? The formatting you’ve applied to your blog will stay the same unless you override it by selecting a font and/or formatting in the new editor. You do not have to set the formatting for each and every post to match your blog’s design. How do I format text? 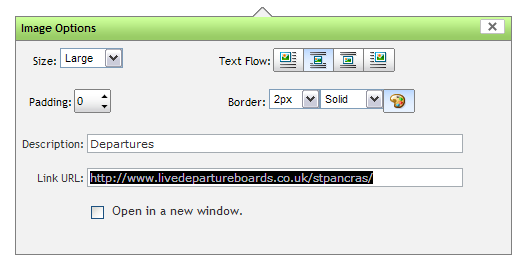 In order to use the formatting options, first type and then highlight the text, then select your desired formatting. We understand that this is a change from what you're used to, so we're looking into a way to bring back the formatting process some of you are more familiar with. Accented and special characters now display properly in Preview: We fixed a bug in the Preview window where characters with accents and other special characters weren’t displayed properly in the Preview window. They should now appear correctly. Text selection is maintained when you resize: We fixed a bug that caused only part of your selected text to be resized. The entire selection of text should now be resized. Quickpost correctly handles draft posts: The quickpost tool was publishing posts meant to be saved as drafts. It's fixed so that posts saved as draft will not be automatically published to the blog. Category selection errors are fixed: We fixed a bug where a small subset of you were seeing categories show up twice, or not at all. The Insert Image dialog doesn’t always display properly on Mac + Firefox: The dialog is sometimes cut off. We’re working on fixing this. Some users are experiencing slowness: Typing in the new editor is slow for some of you. We're working on fixing this. Some users are experiencing formatting difficulties: If you're having trouble applying formatting, whether the line spacing is off or formatting is not being applied correctly, some of these issues could be addressed by making sure you're using a supported browser. If you're still having problems, please help us understand your issue by filing a support ticket describing the problem along with telling us what browser and version you're using and whether you're on a Mac or PC. Other issues: We have updated the Known Issues list with the full list of open issues. Still Have Questions? Please Reach Out To Our Support Team! Finally, if you are experiencing any difficulty with a feature in TypePad, the best thing to do is reach out to our Support team by opening a help ticket. You will receive a timely, personal response from one of our Support team members. When we receive comments here on the Everything TypePad blog that describe a problem or confusion with a feature, we forward them to the Support team to make sure you get a direct response and the specific answer you're looking for. When we have to forward your comment, it takes a bit longer for you to get into the Support queue, so your best bet for a more prompt response is to open a ticket instead. Please be patient, we promise each new Support ticket will get a response! Again, we thank you for all the feedback you've given us. Though the new Compose screen was tested by hundreds of TypePad members over several weeks prior to this first launch phase, we can't anticipate the needs of every single one of our members. Feedback from a larger group always helps us improve our offering. Join your hosts Desiree Scales, CEO of Bella Web Design, and Andy Wibbels, TypePad team member and author of the book Blogwild! A Guide for Small Business Blogging to learn about the power of blogging and how to use it to generate leads and communicate with present and future clients. Watch the webinar from the comfort of your own computer screen, right from your home or office. Register here for this free event at 1pm EDT on May 21st. TypePad’s Mobile offering keeps getting better: Today we’re launching a native application of TypePad for use on the BlackBerry® Curve™ and Pearl™. You can now use those devices to compose, edit, draft and publish blog posts within the BlackBerry interface. This means you can write posts at any time, and from anywhere – whether you’re waiting for a train or plane, you have a few minutes before your next meeting starts, or if you want to be the first to upload notes and thoughts from a conference you’re attending. If you have a BlackBerry Curve or Pearl you can also take photos and quickly and easily upload them onto your TypePad blog. The camera integration lets you capture images and publish them on your blog in two clicks. With this announcement, Six Apart now supports 90% of the mobile market, including Symbian Series 60, Windows Mobile and Palm, as well as a web application for the Apple iPhone. We also expect that a native application for the iPhone will be available soon. TypePad bloggers James Kendrick and Kevin C. Tofel will be running a cool contest on their site jkOnTheRun, which features the latest news and reviews of mobile technology hardware and software. Stop by their site for details on how you could win an unlocked BlackBerry device and a two-year Pro account for TypePad! Visit the TypePad Mobile page to learn all about blogging from your phone. Speaking of bikes, we have a lot of biking enthusiasts who work here at Six Apart. So we're pretty excited to support Bike to Work Week by encouraging all of our employees to bike to work this week. 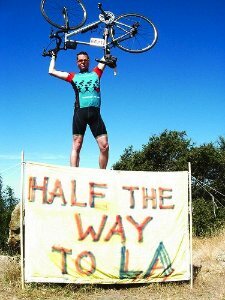 San Francisco's Bike to Work Day is on Thursday, May 15th, and New York City’s is Friday, May 16th. "Biking adds a little more exercise to my day, I get to see some amazing views of SF, helps me reduce air/water/noise pollution, I take routes that cars can't take, and in general biking makes me happy (must be the endorphins). If I bike to work, I don't have to deal with traffic, I get to work in the same amount or less time, I save $7-15 in parking, and a few bucks in gas... I can then convince myself to spend my savings on lunch!" We plan to show our support to all of the bike riders who pass by the front of our office by giving out coffee, juice and snacks on Thursday morning from 7 am to 9 am. If you're in our neighborhood, look for the sign in front that reads, "Six Apart Supports Bike to Work Day". For more information and to find out about events in your area, visit the Bike To Work Week website. Will you be biking to work this week? Let us know in the comments. If you snap a photo of your commute, include a link to it! TypePad has teamed up with Bella Web Design to offer a free webinar on May 21st at 1pm EDT. Join this free webinar to learn why blogging will set your company apart from the rest. Your webinar hosts will be Desiree Scales, CEO of Bella Web Design, and Andy Wibbels, TypePad team member and author of the book Blogwild! A Guide for Small Business Blogging. They’ll help you understand the power of blogging and how to use it to generate leads and communicate with present and future clients. The webinar is free and open to anyone! Register here and join us at 1pm EDT on May 21st. Photos by Stephen. See more at Office Snapshots. If you're looking for a great place to work, we are hiring in our San Francisco, New York and Paris locations. Check out our job listings and come join us!